Peaches are nutritious sources of vitamins A and C, and you can eat these summer fruits for a snack or with almost any meal. Whether you have an abundance of fresh peaches from the summer harvest or you depend on frozen ones, you can lose weight eating peaches. To best fit your weight-loss goals, eat them in moderation, and focus on keeping the rest of your diet low in calories. Because a fresh large 6-ounce peach contains 68 calories, peaches can easily fit into a calorie-controlled diet for weight loss. You need to consume fewer calories than you expend if you want to lose weight, and including low-calorie foods such as peaches can help you stick to a reduced-calorie diet. To reduce your calorie consumption, choose peaches instead of higher-calorie foods. 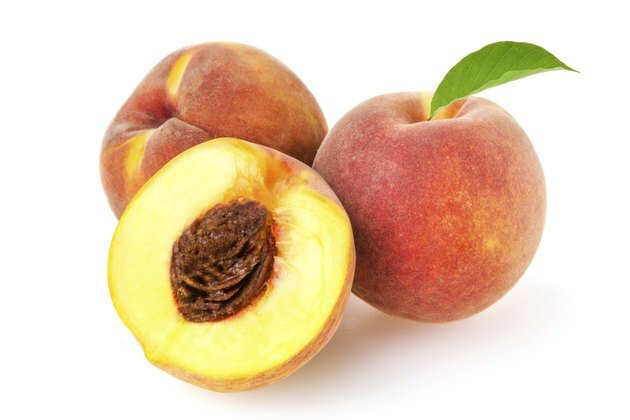 Have a peach for dessert instead of a brownie, which typically has about 227 calories, or snack on a fresh peach instead of potato chips, which have 152 calories per ounce. A large fresh peach provides 2.6 grams of dietary fiber, or 10 percent of the daily value based on a 2,000-calorie diet. A high-fiber diet can aid in weight control because it helps you feel full so you eat less of other potentially higher-calorie foods. Peaches are also filling because water composes 89 percent of their weight. Water is a calorie-free nutrient that helps reduce hunger because it fills up your belly. For a high-fiber breakfast, add sliced peaches to oatmeal or whole-grain cold cereal with skim milk. Some forms of peaches are higher in calories and less beneficial for weight loss. Dried peaches have a lower water content than fresh peaches and have a higher calorie content per ounce. Each quarter-cup serving of unsweetened dried peaches weighs only 1.5 ounces and contains 96 calories. Sweetened frozen peaches contain 118 calories per half-cup, and a half-cup of peaches canned in heavy syrup contains 80 calories. For better weight loss results, choose fresh peaches, unsweetened frozen peaches or peaches canned in their own juice. Eating peaches in a variety of recipes can prevent boredom. For a low-calorie breakfast, try peaches with fat-free cottage cheese or a whole-grain waffle. For lunch, a green salad with peaches, chicken and walnuts is filling and low in calories, but it supplies protein, vitamins A and C, omega-3 fats and other essential nutrients. For a low-calorie, high-calcium snack, grab a low-fat cheese stick and a large peach. You also can grill nutritious skewers for dinner with pieces of salmon, mango, peach, onions and pineapple. Which Dried Fruit Is Healthiest? How Do You Keep Peaches From Turning Brown When Peeling & Slicing Them?